W1 English and Chinese – 2 primary passports for productive and joyful worldwide youth? 1976: aged 11 Jack Ma asks himself : what might happen IF in addition to Chinese I (and my friends and peers) could speak the other worldwide networking language: English? Over the next 20 years, Jack learnt English by guiding tourists, and became his city Hangzhou’s most energetic English teacher, as well as potentially its global youth ambassador. Help us add to our guided tour of 7 social-economic wonders of Jack Ma as a world record job creator. Search out rising exponential consequences of alumni of Jack Ma’s dedication to multiplying human goodwill, Today, in his early 50s, Jack Ma is busy celebrating his home town’s rebirth as the 21st century’s happiest epicenter of sustainable world trade - a role Marco Polo had previously congratulated Hangzhou citizens for staging in the 13th Century as the interconnected Capital of The Silk Road - the network of trade routes linking in the ancient world’s commerce. W2 MarketsFreedom – how to map WWW worldwide web, and win-win-win? 1994: thanks to his translation skills, Jack is sent to California to help negotiate a deal or two. There he saw the worldwide web for the first time- and wondered what could the greatest job creating purpose of WWW. Why not design ecommerce channels so that any hardworking small enterprise –even in the most faraway village – is free to access a global market? Jack appears to have started envisioning a role for his beloved country that could grow with the empowerment of youth to work for a united nations of sustainability. Note how this wonder matches Adam Smith scholars and the Scottish Diaspora mission to design value exchange systems which develop peoples across generations and cultures. Adam in Wealth of Nations, 1776: "To found a great empire for the sole purpose of raising up a people of customers, may at first sight, appear a project fit only for a nation of shopkeepers. It is, however, a project altogether unfit for a nation of shopkeepers, but extremely fit for a nation whose government is influenced by shopkeepers. " W3 Is Financial InclusionDemocracy possible with DT (Data Technology)? Early 2000s: Jack is wondering how to sustain trust-flows through hundreds of millions of online transactions between buyer and seller. He decides Big Data analysis applied to serve small enterprises across ecommerce trading platform is critical and to lead markets designing the most trusted digital financial tools (eg how Alipay from 2004 evolved as online payment platform with no transaction fees ) and financial services (how Ant Financial is evolving with blockchain coding expertise uniting big data partners in ending poverty). Ali Baba calls this moving beyond IT to DT. Consciously or subconsciously Jack Ma orbits around Adam Smith’s core value system published in 1748 Moral Sentiments – trust-flow is what to happily and freely integrate markets around from the bottom up : ie from the smallest, poorest community to the greatest human development vision of worldwide trade- ending poverty. Probably, the most urgent race in Ma’s lifetime now revolves round developing digital banking for China as a financial inclusion system. Digital financial record keeping and ultimately cashless banking can be up to 100 times less costly than having to keep a manual record of everything and distributing cash safely to any global village. Which of two opposite sides will systemically win out from such a sudden transformation? Will it be: the little sister networks born into places that had inherited the least resources from the industrial age or the big brother networks of currency manipulation and designing systems that are too big to fail/exist? W5 youthdemocracy : how much LoveQ is needed for every community to web the greatest #learninggeneration? Between 2000 and 2015, the United Nations spent a lot of energy debating the value of Public Private Partnerships as a way of webbing the world’s economies and societies. It did little to integrate global youth (that is the half of the world’s population under 30] in PPP except at once a year PR shows. Isn’t this a mistake as most of the world’s greatest coders and designers co-create the most while young. Can the purpose of the G20 stage offer worldwide remedies to failing to value youth fully? Leader Xi Jinping authorizes billions of dollars of investment in Hangzhou to host China G20 in August 2016, and brands China ’s entrepreneurial invitations to collaborate around sustainability action networking – The Hangzhou Consensus. Among initiatives showcased , Jack Ma’s Ewtp (Electironic World Trade Platform) appears ready to rock and roll. Why not unite all the world’s small enterprises in an ecommerce platform and let them trade freely? Small enterprises pose no threat to any competitive nation’s economy – in fact they serve to free all of humanity’s races to end poverty and improve the lot. Believers in Adam Smith’s systems discipline have a lot to thank Xi Jinping and Jack Ma for. What futures a place’s youth enjoy are locked in by what economic rules compound – can 2016 be the first year that the human race turns round to value youth sustainability sans frontieres? W7 Futures: QuarterBillionGirls- The Best or Worst of Times To Be Alive? Jack Ma has shown what impacts can come from one Chinese boy’s wonders. He has also set us wondering what LoveQ is. What could happen if every Chinese girl under 30 was freed by education to either speak the 3 most exciting universal languages – Engliish, Chinese and Coding – or to be socially and economically supported by borderless youth linkedin to these meta-collaboration opportunities. How could open spaces be webbed everywhere so that LoveQ family culture interacts the greatest #LearningGeneration? How do we value the lifetimes spent of today’s net generation so that sustainability goals develop people. Inter-generation community is in the DNA of China. It’s time for Chinese under 30s women and parents to be celebrated as citizens ready to help lead a global village world beyond the borders and constraints that only valuing industrial age consumption locked humanity into. While China’s exponential progress of a financial sort over the last 40 years is globally famous, can its social innovation capabilities be shared with global youth in time for sustainability’s climate to return to planet earth? www.cctv-america.com/2016/.../g20-opens-in-hangzhou-amid-weak-global-economy Sep 4, 2016 - China's President Xi Jinping (C) and G20 leaders pose for family photo in . Tim's peers aged aged under 30 in 1976 were united in the most exciting challenge to have ever occupied we the peoples: what will be greatest collabortaion projects on earth become over the next 40 years? 1989 tim berners lee birth of the worldwideweb made collaboration networking visible to everyone; the digital revolution that had conneceted big enterprises in 1980s (from paper based telexes to online global analysis) could now linkin every enterprise and every educational infrastructure. in 1983 harrison owen was convening the worldwide conference for experts in system transformation- like conventional conference producers he assumed his delegates wanted famous podium speakers- feedback from the conference required harrison to radically change his mindset as facilitator of what this profession wanted- they preferred the coffee breaks to the speakers sessions- why? 2 the story of the people who come are the right people : this is used to open the space to remind participants of the context they came to innovate and joyful permission that brings one and all; it also can be used by everyone to verify if the invitation process was diverse enough to have a chance to be the source transformation between future and past ; fast forwarding 30 years and 300000 open space hostings the greatest system transformations have come from where representative of every rival and conflicted perspective came to the open space- which case stories recall open space most joyfully? NB alumni of norman macrae's entrepreneurial revolution curriculum (started in the The Economust in 1972) have argued since 1976 that between 2015-2030 milennials would need china's leaders to be the gretatest colaboration entrepreneurs in sustainability goals- in profiling Xi Jiinping's wonders we cannot claim the same level of verification as our toirurs of other world record job creators - moreover we are cogniscent of the oriental bon mots - a leade cant chnage until her or his people chnage (in this case will jinpings sustainabikity people unite chinese people''s imoacts on the wprld stage with what every parnet wants for sustainable youth? Oct 2016 : China’s President Xi Jinping landed in Dhaka on Friday marking the first visit by a Chinese head of state to Bangladesh in 30 years. Chinese state-media heralded the visit as a diplomatic “milestone” of “historic significance,” as the two countries will sign at least 21 agreements amounting to nearly $40 billion investment in Bangladesh. The deal comes after of a series of investments made by Chinese companies in Bangladesh in the past several months — including a $1.1 billion deal signed this week by Chinese cable manufacturer Jiangsu Etern Co. to strengthen the South Asian country’s power grid, and a $3.1 billion deal by China Railway Group to build nearly 170 km of railroads connecting the capital Dhaka to southwestern cities. Xi is on a diplomatic tour that began in Cambodia and will culminate in a visit to India, during which he will attend the BRICS Summit in Goa. A month ago China unveiled an action plan for China’s controversial One Belt, One Road initiative. The action plan introduces a series infrastructure development projects and trade related agreements along three Silk Roads emanating from China and reaching as far as Europe, Africa, and South America. It undoubtedly will be the subject of scrutiny as analysts and pundits on both sides of the Pacific chime in to make hasty comparisons to China’s 14th century maritime expansion and the more recent U.S. ledMarshall Plan. Some may even go as far to equate the One Belt, One Road to Japan’s pernicious WWII era East Asia Co-Prosperity Sphere – this analogy, to the Chinese, is ultimately insulting. Scrutiny and false comparisons aside, China and the world will be made economically better off by a successful implementation of the One Road, One Belt initiative. China estimates the total benefit stream for investors and firms that participate in the initiative to reach an astronomical USD 21 trillion. Moreover, the prospects of such benefits are particularly timely at a time when global aggregate demand is on a downslide. 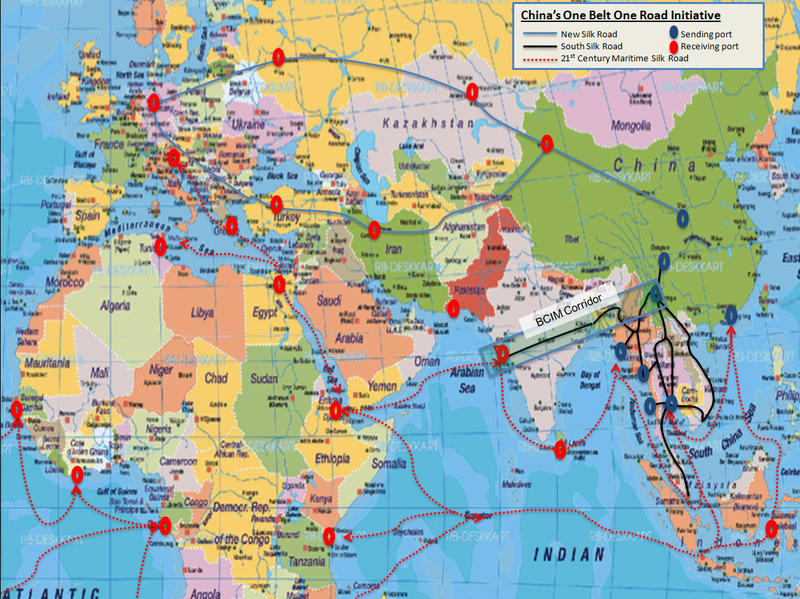 During a series of fall 2013 visits to Asian neighbors, China’s president Xi Jinping first announced the One Road, One Belt proposal as an umbrella concept describing three economic belts extending westward from China toward Europe and Africa. The three economic belts roughly follow historical trade routes linking China with the West and are known as the New Silk Road, South Silk Road, and the 21st Century Maritime Silk Road (See map). After G20 summit, the Australian Prime Minister on September 6th visited Alibaba of Hangzhou Xixi Park, with Jack Ma Alibaba group , Australia signed a strategic cooperation . Alibaba will help Australia to provide more trade opportunities for its domestic brands abd to strengthen the operation in china. In fact, there are already more than 1300 brands in Australia through the Alibaba's Tmall and Tmall international entered the Chinese market, and 80% of the brand is the first time to enter the Chinese market. Ma expressed the hope that through the Internet can help young people around the world to create employment opportunities, at the same time, he also believes that the Internet is able to help the world's small and medium-sized enterprises and young people to do business in the best way, also may be the only way. Turnbull said Ma proposed eWTP is a great innovation, is an important opportunity to provide new impetus to the growth of the global economy, and will help more SMEs into the world's largest market China. Ma's other national leaders meetings during the G20 summit :Italy's prime minister Ferenczi, President of Indonesia zuoke, Canadian Prime Minister Trudeau also came to the park and Ma Alibaba talked to the Alibaba to seek cooperation. In addition, Argentina President Ma Kerrey, Thailand Prime Minister Pakistan, Kazakhstan President Nazarbayev and other also have a dialogue with Ma Yun, hoping to establish a close partnership between the two sides by eWTP. Among them, the Prime Minister of Thailand who delayed his departure to spen extra time with Ma. explosions of creative potential that catalyse exceptional levels of innovation. services, a strong research community and growing private sector expertise. Blockchain: Could it make interoperability issues a thing of the past? Furusawa said financial inclusion is one key for promoting strong and stable ... example, using financial technology to leapfrog traditional banking systems ... through the use of digital currencies and blockchain technology. ... cell phones, mobile payments have begun to leapfrog over paper currency. ... The Swedish financial industry realized that fee-inclusive transaction ... has recently joined many of its peers in looking at blockchain technology. The way mobile leapfrogged fixed lines communications in Africa, blockchain willleapfrog a lot of the financial infrastructure that exists today.”. The Exponential Finance 2016 conference, organized by Singularity ... stated thatfinancial blockchain applications will be measured in the trillions. ... for the developing world to “leapfrog” to the forefront of innovation. In the financial, banking and lending services sectors, however, P2P will bring a sea ... Already, technology known as the blockchain, which harnesses idle ... in aggregate, leading to a leapfrog effect with new technologies. ... now mainstream or on the verge of being mainstream, Ant Financial, an affiliate ... to bypass the banking sector and leapfrog their economies. The European telecommunications giant is the parent of the Kenyan telecom Safaricom — which provides the M-Pesa digital finance product.